Back in April of this year, J.J. Abrams debuted the very first footage of Overlord to an enthusiastic crowd at CinemaCon. The footage was described as "bonkers" from more than one attendee and now the whole world gets to see what all of the fuss is about. Though there's no connection to the Cloverfield universe, the descriptions alone from the footage shown at CinemaCon has kept the mysterious film hyped up, which means that now is the perfect time to release the first full-length trailer. Overlord was originally expected to be a follow-up to The Cloverfield Paradox, and the fourth film in the franchise, but that is certainly not the case. Instead, J.J. Abrams announced that the movie is just a World War II thriller with zombie Nazis and other insane elements set 12 hours before the events of D-Day. The film will mark the first time that Abrams' Bad Robot has ever put out an R-rated project, which should already tell you something about the footage that unspools in this crazy first trailer. Even J.J. Abrams described Overlord as "batsh*t crazy," while presenting the first footage a few months ago, and it appears that the director/writer was right on the money. Overlord is completely different from anything that one would expect from Bad Robot, never mind anything with J.J. Abrams' name on it. The rocking soundtrack keeps everything moving and invites further exploration to try and figure out what exactly is happening in the trailer. It's clear that Overlord is trying to set itself apart from the pack, which is evidenced by the pre-San Diego Comic-Con jump to get the trailer out. 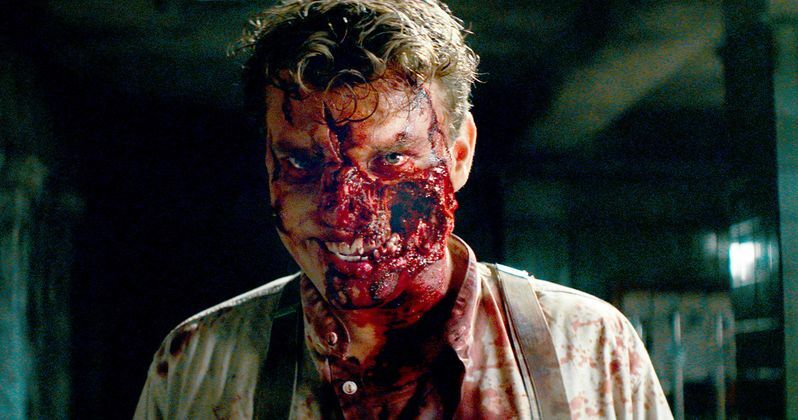 Overlord Stars Jovan Adepo, Jacob Anderson, and Black Mirror star Wyatt Russell. As previously noted, the film is the first R-rated project to be released by J.J. Abrams' production company Bad Robot. While there is certainly some disappointment that the new film is not connected to the Cloverfield universe, Abrams has recently stated that a follow up to the The Cloverfield Paradox is already in development, which means that it can be released secretly any day now. However, it's more than likely that they will take a different marketing approach this time around and will shy away from another Super Bowl debut. Overlord looks like it should take some attention away from the Cloverfield universe for the time being. An official synopsis for the film leads one to believe that there's a lot more going on than anybody ever imagined, even after seeing the trailer. The synopsis reads. "On the eve of D-Day, paratroopers drop behind enemy lines to carry out a crucial mission for the invasion. As they approach their target, they soon begin to realize there's more going on in the Nazi-occupied village than a simple military operation. There's definitely a lot more going on than anybody at CinemaCon got close to describing after seeing a sneak peek. The intriguing trailer for Overlord can be seen below, thanks to Bad Robot.